Agelena labyrinthica, a funnel web spider, has a body length of up to 18 mm. The abdomen is dark with a pale central band flanked by white chevron marks. The cephalothorax is yellow-brown and bears two, broad longitudinal stripes positioned towards the front of the spider. They build flat surface webs connected to funnel-shaped retreats, which are typically constructed between low lying grass and vegetation. 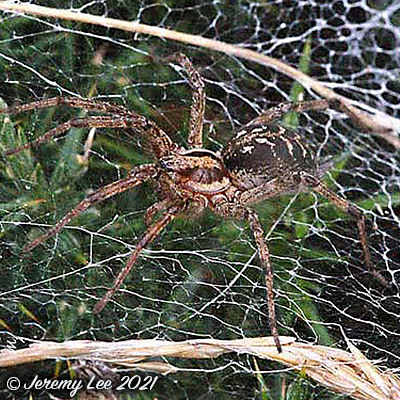 These webs can be at ground level, or up to 1.5 metres from the ground, however, the majority are found approximately 60 centimetres off of the ground. These spiders are fairly common in the UK, and are typically concentrated in areas near forests and low lying vegetation, as well as in dry grasslands.